Ancient Dolgan legends regale listeners with tales of tremendous skill hunting wild reindeer with bows and arrows, and even slingshots. Ironically, the Dolgans are one of the “youngest” ethnic groups to be formally recognized – as late as the 19th century. Yet the origin of the Dolgan people stretches back into the depths of time. 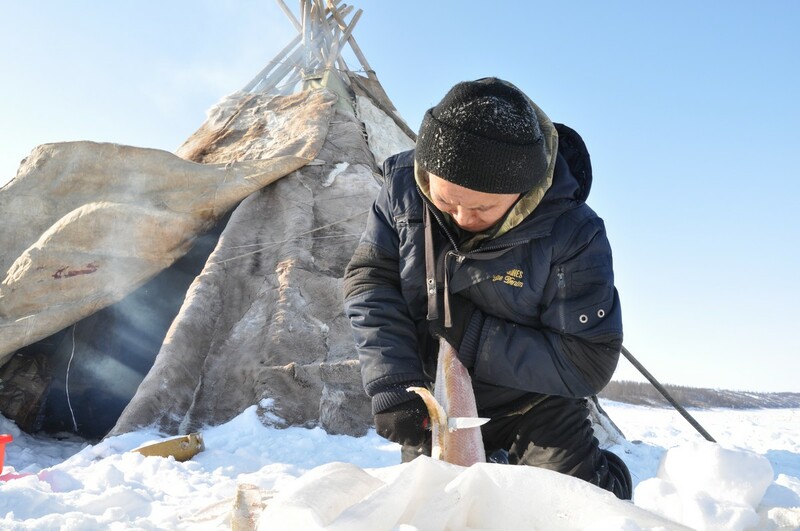 Their ancestors are often traced to Evenki tribes, or Tungun, who originally lived west of the Lena river. Sakha neighbors heavily influenced the Evenki language, until they eventually spoke more Sakha than Evenki. In the 17th century, the Khatanga Tract, or the Great Russian Road, connected diverse Arctic peoples who traveled it by means of reindeer and dogsled. 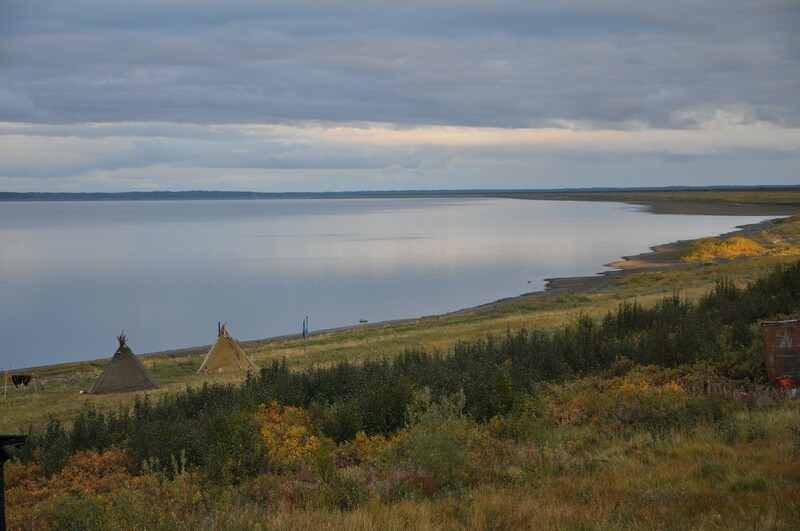 As the Russians continued to move into their territory, these Arctic groups migrated into the Taymyr Peninsula. Over time, their culture coalesced into a distinctly Dolgan unity – an impressive convergence of many time-honored Arctic traditions. 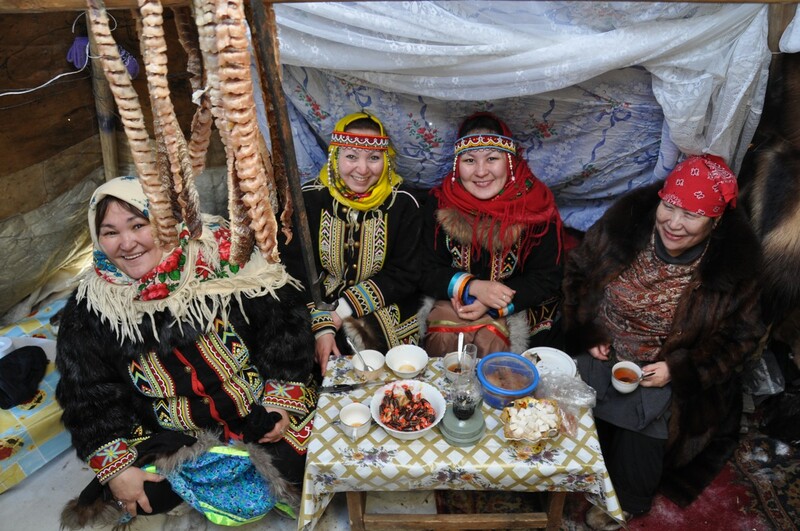 The Dolgan language today is Turkic in origin, closely related to Sakha, but distinctly its own language. 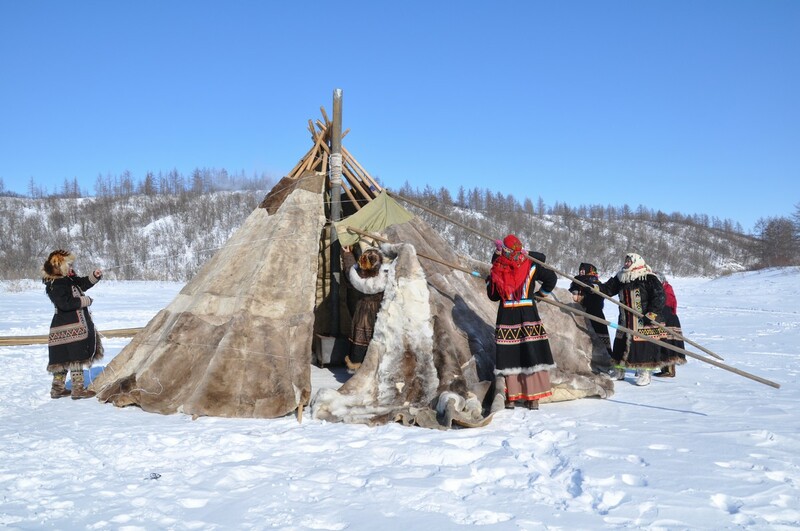 Of the 7,000 Dolgan people inhabiting the Taymyr, a part of the Krasnoyarsk District, many still speak their native language, especially outside of the cities such as Dudinka and Norilsk. From the beginning, their people's survival was closely tied to the reindeer, which they raised in domestic herds as well as hunted in the wild. Nomadic by necessity, they followed the herds along ancient routes, which varied from year to year depending on the condition of the pastures. They spent their summers on the open tundra, wintering instead along the forest-tundra line. The need for new food sources for the reindeer forced them to relocate winter camps often. As spring neared, the camps broke into smaller groups of a few families. They spent their days with the herds, following them along lakes and rivers. 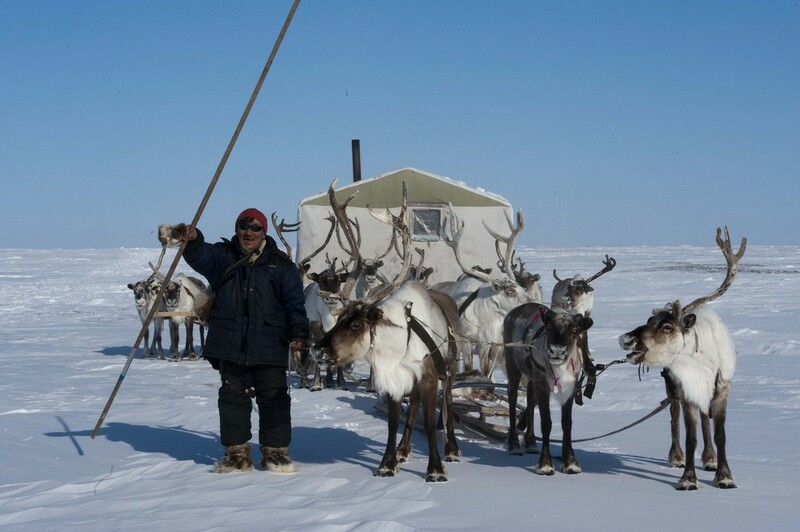 Appropriately, their self designation “Dolgan” means “people who live near the water.” In summer, an ideal method of travel was on reindeer-back; in winter, a team of five reindeer often pulled a balok, a conveniently-portable home built of poles and covered with skins, mounted on sledge runners. Arctic fox, hares, ptarmigan, geese, and ducks provided game beyond simply reindeer. The Dolgan were also renowned for their fishing ability with traps, nets, and snares. Dolgan craftsmanship is marked by its brightly-colored and geometric style. Rich embroidery – dyed red with ochre or alder tree, black with graphite – graces traditional clothes and shoes. Intricate beadwork in bright patterns adorns clothing as well. Carving of mammoth ivory and wood is another well-developed talent among the Dolgans. Their lively and artistic tendencies also shine through in their folklore – a treasure of riddles, songs, and enchanting stories of animals and magic. Though the Orthodox religion of the Russians is prevalent, traditionally the Dolgans have held animist beliefs. Their shamans acted as the bridge between the physical world and the spirit world. They communicated with ayy, or good spirits residing in stones or other objects, and with harmful spirits, abaasy, which could enter the body and cause disease. Like the Nganasan, the Dolgan culture is still haunted by the effects of Soviet collectivization. Boarding schools stripped many of their native tongue. Russian-imposed settlement altered their focus away from a nomadic lifestyle following the herds to trapping and other activities more convenient to sedentary life. 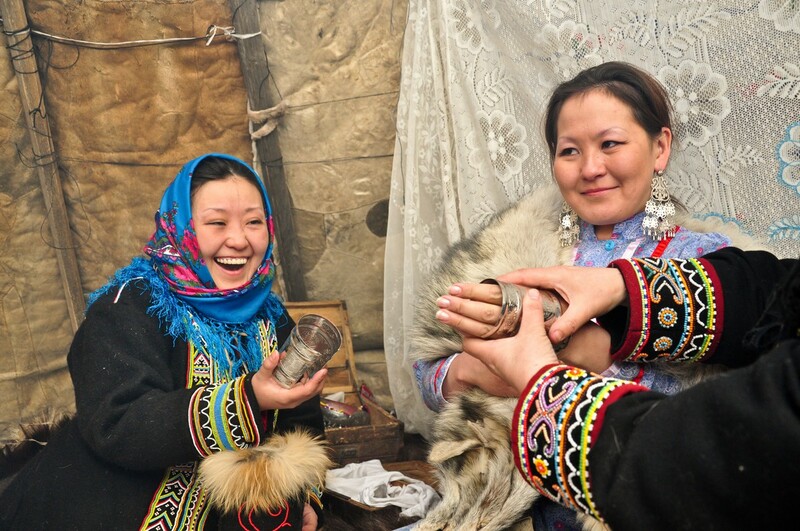 Despite these challenges, the Dolgan fight to maintain their traditions while thinking of the future. On the tundra, snow mobiles, stoves, and cell phones mix with reindeer and sleds. 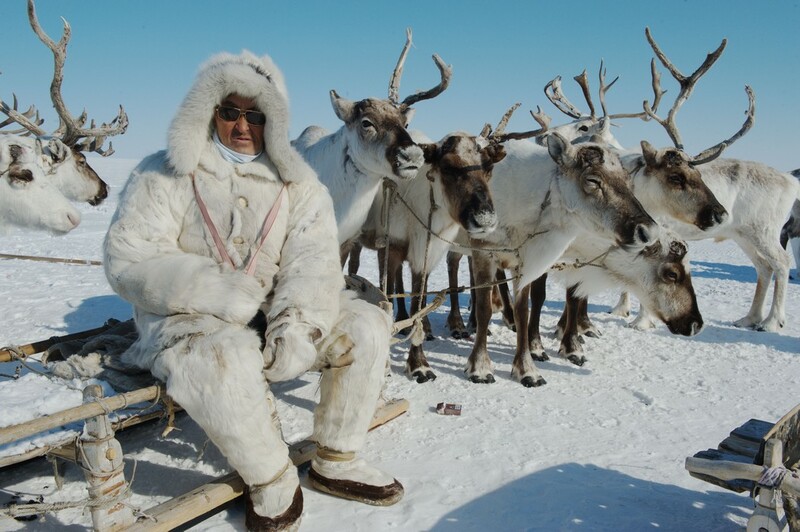 Modern clothes work for relaxation, but when it comes to hunting in the Arctic, reindeer-skin coats and boots are second to none. Educational opportunities are expanding, as the Taymyr region seeks to train their youth in needed careers, such as welders, drillers and electricians. At the same time, they are keeping alive the skills that gave the Dolgan its spirited legends – hunting the reindeer on the tundra.